The Controller is specially designed for PlayStation 4 console. Built-in three-axis gyroscope and three-axis accelerator offer you great gaming experience. It is also compaitble with part Windows PC. Specially designed for PlayStation 4 console, adapting DualShock 4 wireless controller program. Featuring with latest motion-sensing technology, built-in three-axis gyroscope and three-axis accelerator. Dual-point capacitive sensing touchpad on the front of the controller and dual motor vibration offer better gaming experience. The controller supports on-line firmware upgrading to avoid its mismatch with PS4 console once the console updated to latest system. It can capture the 3 axis acceleration information of three-dimensional space X,Y,Z, and transmit all information captured to the game system quickly. 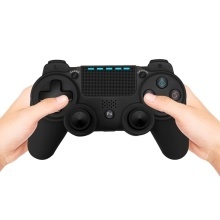 The whole controller is coated with rubber oil, providing you better hand feeling. Equipped with 3.5mm stereo headset jack and a built-in speaker, putting several new audio options in your hands.